When a piece of flash fiction has particular strength the reader is able to envision the main character almost as a portrait, where we can interpret the life of the protagonist in a complex manner, obviously quite the task to pull off in a thousand words or so. The below 950 words in Roxane Gay's "Cheap, Fast, Filling" from our Issue 03 release, guides the reader into such an experience. We're given a glimpse into the lives of those we rarely hear about, refugees surviving on the bare minimum, their only sustenance coming from empty calories so to speak, exemplified in Lucian, a man flawed by desperation. Roxane Gay has become one of our most important voices in literature. She has often been a vocal advocate for minorities in publishing. Besides her many renowned essays on the matter, she recently has spent time blogging for The Nation, illustrating how a broad range of voices participating in the literary conversation will only strengthen our community, which is of course a core value behind Weave's mission. At the time, we were proud and excited to include this wonderful story in our collection. In looking back, we're even more grateful to share this again. When Lucien arrives in the United States by way of a trip to Canada, an illegal border crossing, and hitching rides down to Miami, his cousin Christophe, who made his own way to Miami years earlier hands him a 50 dollar bill and tells Lucien to eat Hot Pockets until he gets a job because they are cheap, filling and taste good. Lucien sleeps on the floor in an apartment he shares with five other men like him, all of them pretending this is better than that which came before. There is a small kitchen with an electric stove that has two burners and a microwave that is rarely cleaned. Christophe also tells Lucien that Hot Pockets are easy to prepare. Because he doesn’t know how to cook, Lucien is grateful for his cousin’s advice. Lucien is in the United States because he loves Miami Vice. He loves the shiny suits Tubbs and Crockett wear. He loves their swagger. He loves the idea of Miami as a perfect place where problems are always solved and there are beautiful women as far as a man can see. In secondaire, Lucien would daydream about Miami while the French nuns frowned and slapped his desk with their rulers. He has not yet seen that Miami but he knows it is there. It has to be there. Lucien’s apartment is in Pembroke Pines—a world away from Little Haiti and everything that might be familiar in an unfamiliar place. Every morning, he wakes up at five, showers, gets dressed. He walks four miles to the Home Depot on Pines Boulevard where he waits for contractors to cruise through the parking lot looking for cheap, fast labor. He stands in the immigrant bazaar with the Mexicans and Guatemalans and Nicaraguans, sometimes a few Chinese. They stand tall, try to look strong, hope that a long white finger will curl in their direction. Three or four times a week, he is lucky. He grabs his tool belt, hauls himself into the truck bed and enjoys the humid morning air as he is driven to big white houses owned by big white people locked behind gates to keep things safe from people like him. Once a week, Lucien buys a calling card for $25. It will allow him to talk for 28 minutes. He calls home where he talks to his mother, his uncle, his wife, his four children. He tells elaborate fables about his new life—how he’s found them a new home with a bedroom for each child, and air-conditioning so they can breathe cool dry air. There is a lawn with green grass and a swimming pool in the backyard by which his wife can lay in the sun. His children, two boys and two girls all under the age of ten, clamor for his attention. He strains to understand them through the static on the line. They tell him about school and their friends and the UN soldier who is renting a room in the house, how he’s teaching them Brazilian curse words. When there are only a few minutes left, his wife chases the children into the bedroom they all share. They are alone. There is no time for anything tender. She whispers that she needs Lucien to send more money, there’s no food, there’s no water. She wants to know when he will send for them. He lies. He tells her he’s doing all he can. He says soon. On the weekends, Christophe picks Lucien up in the truck his boss lets him take home and they go to house parties in Little Haiti. They listen to konpa and drink rum and as all Haitians are wont to do, they philosophize about how to solve their country’s problems. “Haiti,” his father would always tell Lucien while he was growing up, “is a country with seven million dictators.” Sometimes, when it is very late at night, Lucien will find comfort in the arms of a woman who is not his wife. He will go home with her and in the darkness, as he cups her breasts with his hands, and listens to her breathing against him, as he presses his lips against her neck, and her shoulder, then licks the salt from her skin, he will imagine that she tastes like home. Around the corner from Lucien’s apartment is a 7-11. Sometimes, when he can’t sleep, Lucien likes to go to there because it is cool and bright and white and clean and he can buy Hot Pockets. The man who works there late at night is also Haitian. He understands why Lucien likes to slowly walk up and down each aisle, carefully studying each row filled with perfectly packaged products. When the clerk first arrived in Miami, he did the same thing. Lucien thinks about the sweet things he would buy for his children if they were with him and how much it would please him to watch them eat a Twix bar or a Kit Kat. Each night, before he leaves 7-11, Lucien buys two Hot Pockets that he microwaves, and a Super Big Gulp. He walks home and sits on the curb in front of his building so he can be alone. He drinks slowly, so slowly that there’s no ice left in the cup when he’s done. He eats one of the Hot Pockets and the other one, he holds. He enjoys its warmth, thinks he’s holding the whole of the world in his hands. Over the past several months, the United States (or parts of it, at least) has crossed a number of sociological, political, and historical divides—think marriage equality legislation and marijuana legalization, for starters. However, for me, two events stand out: the re-election of President Barack Obama and the death of noted poet and feminist Adrienne Rich. What the two have in common is that they both rose to the top of their respective paths without the support of—and even the active opposition of—white males. Rich’s power and recognition grew as the power of white males in the United States declined, and President Obama won both his national elections without support from the majority of white males. DNA database hubs. A mug’s game! A blunt kick in the khakis! weighted, and who’s strung up in we. Raptosh gives her character a Hobson’s choice: He can either remain untethered from a culture that gave him privilege at the expense of others, or he can re-enter that culture and forgo the redemption he found through having his memory erased. Or maybe there’s a third choice: take the best of the past, jettison the rest, and move forward. Raptosh’s white male protagonist combines longing, regret, remorse, self-discovery, and reinvention in just the right proportions. Of course, it is ironic that Rinehart/Doe has the ability to start over precisely because he is a white male of means, a status which he tries to renounce. as if it were Lisette’s first look. At each momentous stage of his life, a Sioux Indian earns a new name. Jumping Badger landed the tag Sitting Bull on killing his first bison. Unfriend was just dubbed word of the year. The name’s John Doe, and I’m just lying doggo here on wheezing earth. When Adrienne Rich won the Yale Younger Poets Award in 1951, few people felt the United States was on the path of becoming a country that would embrace marriage equality and an African American president. What these poems do best is to synthesize our experience—both intellectually and emotionally—and try to make sense out of the cacophony. 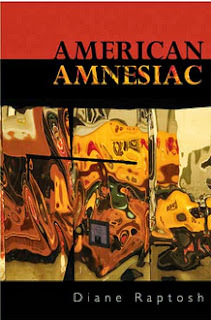 Like Rich, Raptosh sees a changed world, and the poems in American Amnesiac point with a “spine of possible decency” toward it. The passing of Irish poet Seamus Heaney has sparked numerous conversations, in both print and on the Internet, of how his work’s significance was due in part to its strong connection to the lives of determined and vulnerable citizens. He was described as a poet who capably expressed “the rhythms of ordinary lives,” by delving beneath domestic pantomime and finding an inner darkness or hope. 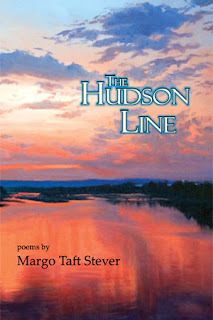 Similarly, Margo Taft Stever’s The Hudson Line summons the stories of citizens along the route of a suburban commuter train—privilege providing little protection from the chaos that enters lives without warning. It is a haunting ride filled with longing, rage, fear, and a determination to find the right words to share the stories of one’s life. The wild moon foamed at the mouth. The wild moon crept softly at her feet. the cold blade sinking in his skin. In “House Raising,” the vestiges of rigorous indoor children’s play result in a furious husband admonishing his wife. Her recollection of the children’s games becomes metaphorical for how creating a homestead (“…houses out of cushions, / intricate cities and roads / out of rugs and blocks,…”) can dissolve into stains and frayed remnants underfoot. “The Worst Mother” and “Step-Mother” play upon fairy tale perceptions of failure and fright in the maternal dynamic. The first lists affectionate ritual (“Playing music / for you before / you were born,...”) and the suffering of a child’s illness (“The night you gagged / and choked up shreds… / I comforted you). The latter poem unleashes a litany of brutal powers (“The step-mother’s fangs lengthen / in moonlight.”) as well as the curse of circumstance (“A step-mother is always evil, / marked by the blood of her husband’s children. / She tries to climb into the other’s shoes). Stever captures the complexity of what dwells beneath even the most cantankerous or hardened persona. In “Beulah Reid,” the “cruel nanny” taunts her charges with the sticks the children find outside (“Some are blunt, others sharp, / spring loaded. You twist them before us.”). She hisses at them “with damnation” and is reduced to an old broken woman with “…stocking pulled down over ankles, the corridors of your bulging / legs, your jutting veins…” who seeks the sedate strains of an old television show for elderly viewers. In an instant, the harridan is anyone’s aunt or grandmother, another transformation that mingles poignancy with pain. The Hudson Line mixes cautionary tales with those of wonder and persistence (“The Quickening,” “Why So Many Poets Come from Ohio,” “Queen City”), and ignites the live wires of what ultimately makes us human. It is a testament to the poet’s empathy and grace, capturing the resilience and terrors of seemingly ordinary people. 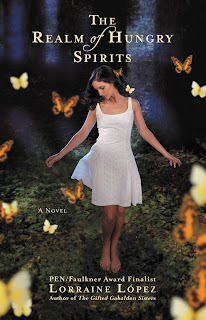 The Realm of Hungry Spirits by Lorraine Lopez is an overwhelming search for personal peace, for both characters and readers. Lopez drops readers into the main character’s varied and complex life, and readers will be compelled to learn how the drama unfolds and resolves—all in the span of two weeks. They may also reach for a bottle of wine just to tolerate the stress. Marina Lucero is a middle-aged teacher who opens her home to friends and family members in need of shelter. Her unstable life becomes overrun with their troubles, such as her friend Carlotta who flees from an abusive husband, her nephew Kiko who is kicked out of his house, her little sister’s ex-fiancé Reggie who is grieving from their recent breakup and living with Marina for the time being, and her well-meaning but dimwitted ex-boyfriend Rudy and his blackmailing friend. Everyone turns to Marina because she is intelligent, reliable, and giving. To relieve her chaotic life, she relies on teachings from the Dalai Lama and Gandhi—teachings that play heavily into the overall plot. But Marina—despite her good intentions, responsibility, propensity to care too much, and lofty spiritual goals—is an unreliable narrator amongst many unreliable characters. Her emotions can flip at least three times in one page, and she is subject more to rage and pheromones than the rationality she attempts to wield. Her loneliness gets the better of her more often than not, and readers are left wondering how one so intelligent can lack emotional follow-through. Luckily, Lopez is deft at making readers quickly sympathize with Marina’s plight. From the first chapter, readers are bombarded with Marina’s troubles in order to quickly understand her anger, annoyance, and exhaustion: Her nephew starts a rap band one morning and by the evening, he’s acquired a small dog to train for fights and claims it’s his calling; a neighbor’s sister asks Marina to help her pack belongings but is caught in the act of trying to rob a former married lover; Marina’s younger sister dates and seduces anyone who might seem financially well-off; and an ex-boyfriend’s best friend threatens spiritual curses if Marina doesn’t follow the friend’s instructions concerning his custody deposition. The tribulations quickly pile atop Marina, and it’s a wonder she manages to keep everything in line. “I nod, my cheeks suffusing with heat. The Dalai Lama’s gentle face appears in my mind’s eye, his expression sharpening into disapproval, even disgust. Compassion, he writes, is built upon connections forged through recognizing similarities, not by fixating on differences and holding in contempt those who are different, as if they are lower than the self” (122-123). Throughout the story, Marina seeks like minded people who are intelligent, responsible, and clean. Those who don’t fit these traits are usually met with consternation and impatience. It takes a small family to make her realize she’s been looking at compassion with the wrong perspective. She doesn’t often recognize the good in people around her until they shove it in her face. The passage above is a subtle turning point in the story—a eureka moment for her. Although Marina’s internal world grounds the story, readers unfamiliar with Los Angeles may feel lost amidst the geographical references and the consistent use of Spanish in both narration and dialogue. They may also wonder if life is really how she depicts it: poverty results in insanity and promiscuity, most men are too lazy to be responsible for anything, and most uneducated women are weak, selfish, and manipulative. It’s not a pretty rendering. Yet, most of the characters exhibit a moment of pure humanity, such as when an abusive husband reveals intense love and stand-offish teenagers show compulsions to please. If readers substitute their own neighborhoods for the one in Lopez’s novel, they might recognize themselves or the people around them. This returns readers to the aforementioned passage; there is always something that connects us to everyone else, and we must recognize that similarity and feed it in order to gain peace. 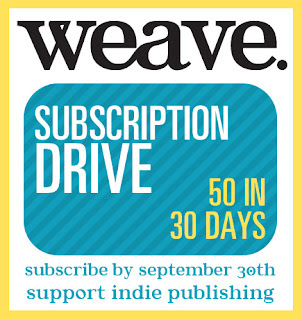 As an independent literary journal, Weave Magazine relies on the support of our readers. Weave exists because you believe in our mission of writing, art, diversity and community. Weave exists because of our amazing contributors. Weave exists because of the support of our local arts and literary community. Weave exists because of subscribers. Our past subscription drives have been successful, and we want to continue that success this month while celebrating our latest issue. Our goal for this drive is 50 subscriptions in 30 days, because we believe in our community, our mission, our contributors, and in YOUR support! Two copies of Weave Magazine at a sweet discount! A public thank you on our website, including a link to yours! Start with our latest issue buy purchasing a current issue subscription (issues 09 & 10), or get issues 08 & 09 at once by purchasing a bundle issue subscription. All subscriptions are discounted during the entire month of September! 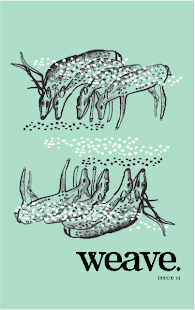 We just reopened to submissions, so it is the perfect time to get your hands Weave. If you are sending us work, consider supporting the publications in which you envision your work. Support indie publishing by subscribing to a fantastic journal of the best in contemporary art and writing.